I'm LOVING the new My Mind's Eye Hello World I Want It All Bundle from FotoBella! 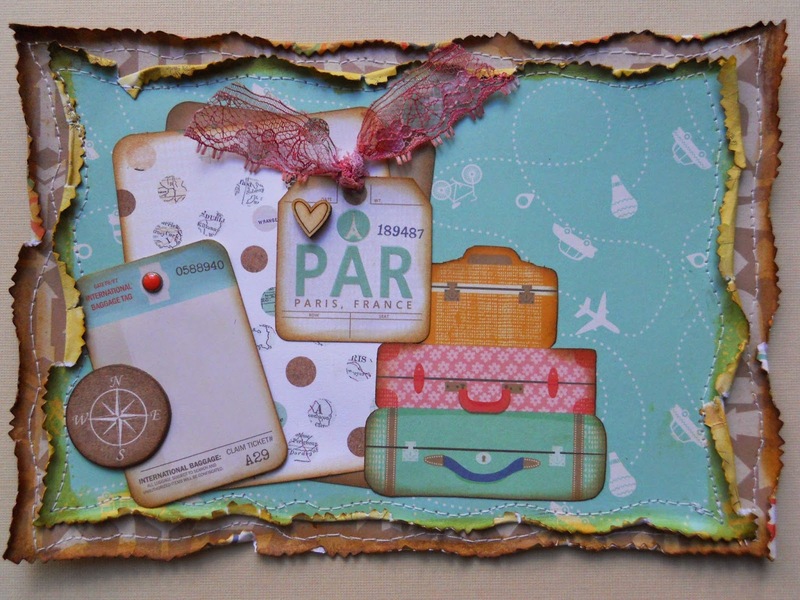 This card has lots of layers and distressing, and was a lot of fun to make! 1. Cut a card at 8 1/2" x 6" from the cream cardstock and ink around the edges with Distress Ink (Vintage Photo). 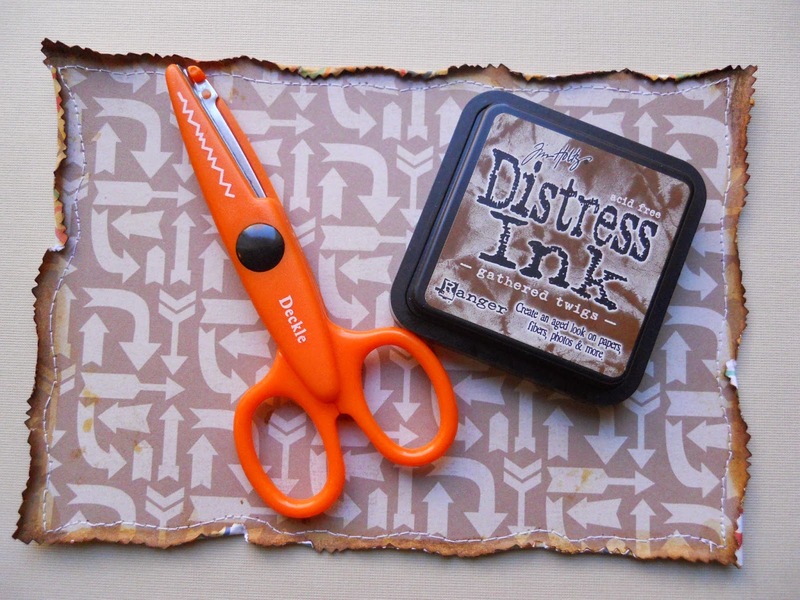 Cut the same size from the brown arrow "All Aboard" paper, and trim the edges with decorative scissors, inking them with Distress Ink (Gathered Twigs). Wet the edges with some water and distress and curl your edges. After it dries, machine stitch around the edges. 2. Cut 8" x 5 1/2" from the aqua "Discovery" paper, and repeat the cutting and distressing technique from above, using Distress Ink (Vintage Photo) on the edges. Attach to the arrow paper and sew around the edges. 3. Fussy-cut the luggage from one of the Adventure Journal Cards, and ink the edges of the image and card that you cut from using Distress Ink (Gathered Twigs). 4. 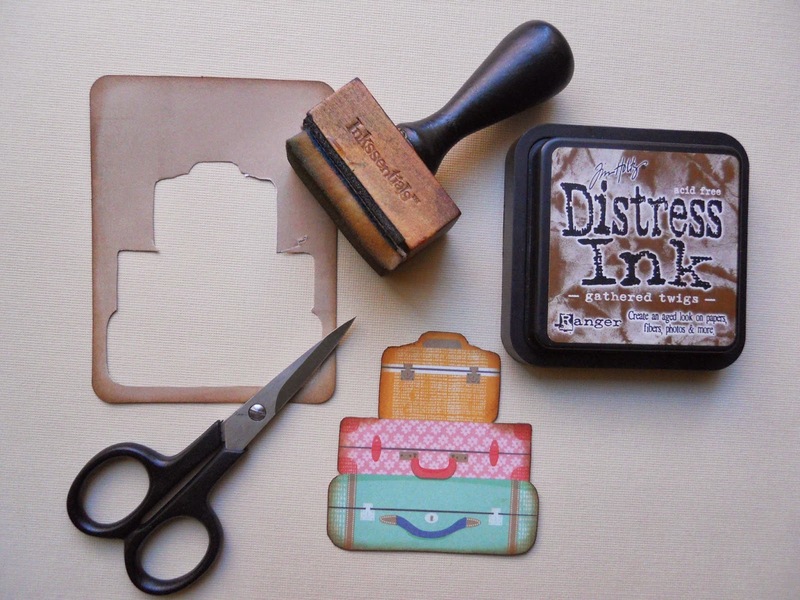 Place the brown card along the left, and layer with the polka dotted one, again inking all of your edges. Then place the Sticky Note on top adding the pink decorative brad. 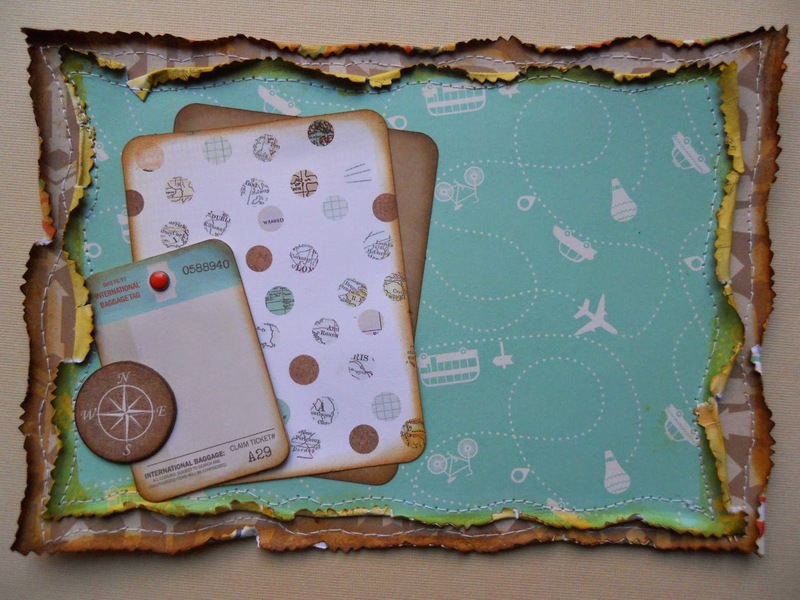 The chipboard compass comes in the Travel Mixed Bag and also gets inked. 5. 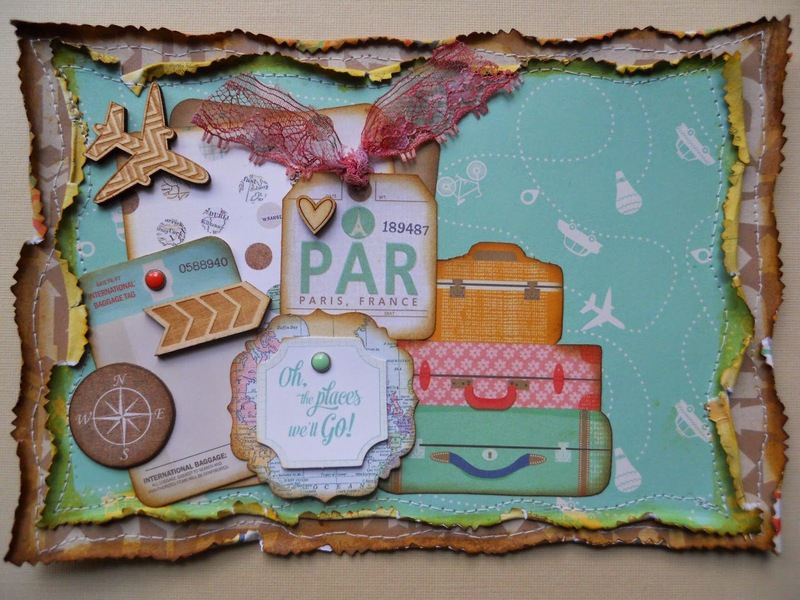 Take the Paris tag, which also comes in the Travel Mixed Bag, and again ink around all of the edges. Add some lace or ribbon along with the wood veneer heart. Glue the luggage down adding the tag to the left. 6. Now attach the brad with the Oh the places we'll go tag, adding the wood veneer plane and arrow. 7. 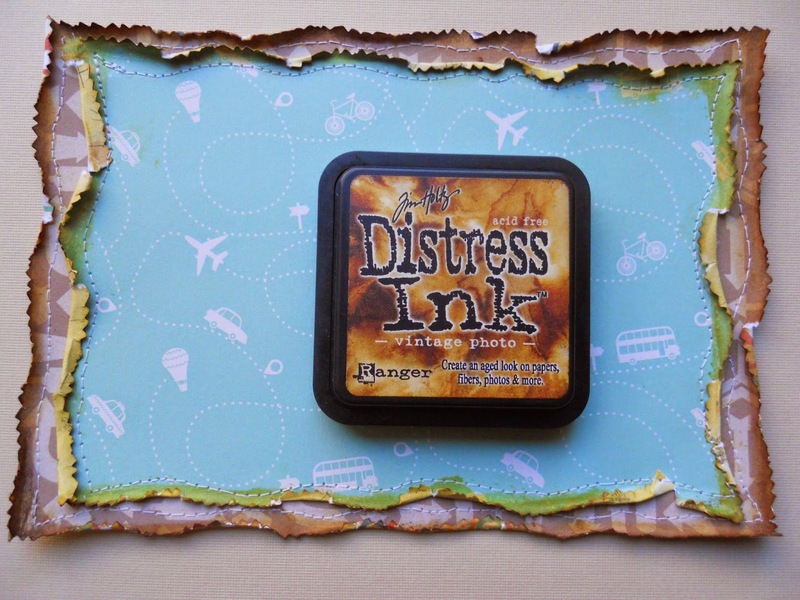 To make the banner, ink the edges of the banner pieces from the Travel Mixed Bag, with Distress Ink (Vintage Photo). 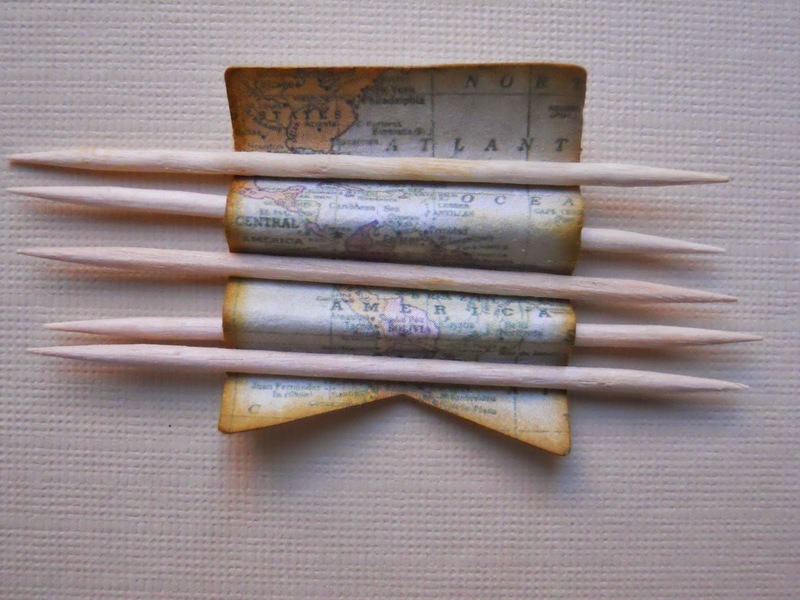 Dip quickly in water, and use toothpicks to shape it, wrapping the banner around and over the toothpicks. Once dry attach to the right, and glue some rope or twine right above it. Now you can glue your layered papers to your card! Thanks for your visit! Have a great day! 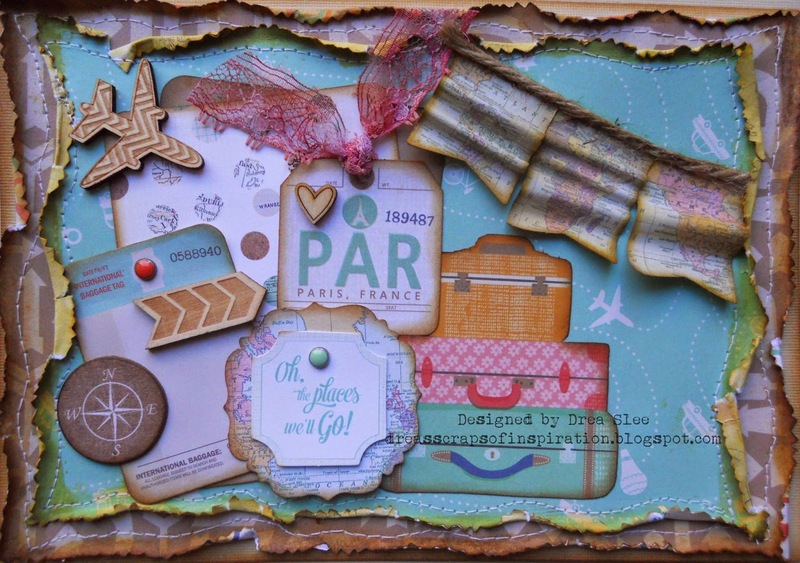 Really beautiful card Drea, and great tutorial!